I was visiting family in the Northeast U.S. when Sandy came ashore, so I was without power for most of last week. Since my return home, I’ve been catching up with all of the nonsense surrounding Hurricane/Extratropical Storm/Hybrid Storm Sandy. There have been hundreds of articles and blog posts that include references to climate change, global warming, and the warming oceans and their assumed impacts on Sandy. 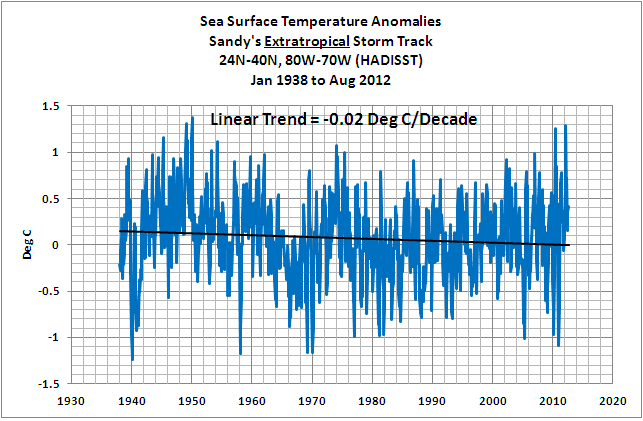 Yet no one has bothered to plot the long-term sea surface temperature anomalies for Sandy’s track. So we’ve had lots of baseless claims. Will the authors of those posts and articles feel foolish when they discover sea surface temperatures for Sandy’s path haven’t warmed in 70+ years? For those reading this post, who have access to the authors of those articles or the blog posts, feel free to leave them a link or two to this post. The most absurd claim was made by Brian Reynolds in his post How a Warm Earth fueled Hurricane Sandy at The Energy Collective, which heralds itself as “The world’s best thinkers on energy and climate”. It was the topic of discussion in the post Frankenstorm-itis: Five degrees of Separation from Reality and Eleventy Gazillion Joules Under the Sea by David Middleton at WattsUpWithThat. The Atlantic ocean [sic] is five degrees warmer than is was when most of you were born. Let that sink in for a minute. The entire Atlantic ocean [sic] averages five degrees warmer. Oy! Five degrees. He must believe most of us were born just after the last glacial period. That’s older than Mel Brooks’ 2000 Year Old Man. The point of this piece isn’t the exact temperature of the ocean, which is admittedly hard to calculate (You’ll note in reading one other comments that you don’t agree with me or one another after all) but rather that the earth isn’t a closed system. Actually, Brian, you can’t dismiss your error and state that it’s pointless. You wouldn’t have written what you wrote if you thought it was pointless. Also, sea surface temperature data is available to the public through multiple resources (NOAA’s NOMADS website or the KNMI Climate Explorer) so there are no calculations involved. All you have to do is enter coordinates and the websites produce the data. 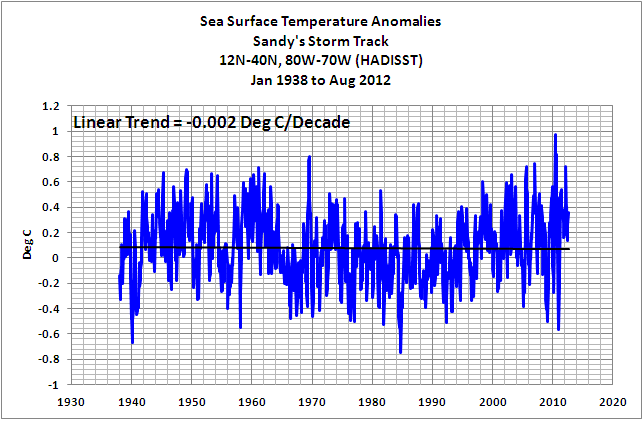 If you had done that with a long-term sea surface temperature dataset like the Hadley Centre’s HADISST, you would have discovered that the sea surface temperatures anomalies of Sandy’s storm track (12N-40N, 80W-70W) haven’t warmed since 1938, when the another super storm hit the Northeast U.S. See Figure 1. 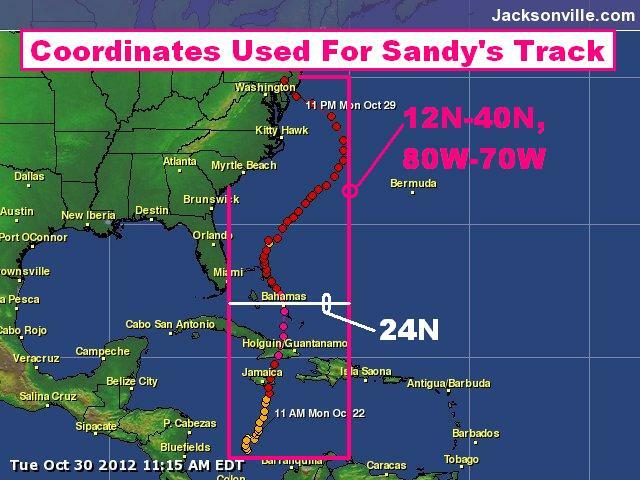 The coordinates are based on the storm-track map from the Jacksonville.com, which I’ve annotated in Figure 2. For the extratropical portion of the path (24N-40N, 80W-70W), Figure 3, the sea surface temperature anomalies have actually cooled since 1938. It’s not a great deal of cooling, but the trend is clearly negative. The satellite-era sea surface temperature records indicates El Niño and La Niña events are the primary causes of the warming of global sea surface temperature anomalies over the past 30 years, not manmade greenhouse gases. I’ve searched sea surface temperature records for more than 4 years, and I can find no evidence of an anthropogenic greenhouse gas signal. That is, the warming of the global oceans has been caused by Mother Nature, not anthropogenic greenhouse gases. Please buy a copy. (Credit/Debit Card through PayPal—you don’t need a PayPal account). It’s only US$8.00. You’re probably asking yourself why you should spend $8.00 for a book written by an independent climate researcher. There aren’t many independent researchers investigating El Niño-Southern Oscillation or its long-term impacts on global surface temperatures. In fact, if you were to perform a Google image search of NINO3.4 sea surface temperature anomalies, the vast majority of the graphs and images are from my blog posts. Try it. Cut and paste NINO3.4 sea surface temperature anomalies into Google. Click over to images and start counting the number of times you see Bob Tisdale. By independent I mean I am not employed in a research or academic position; I’m not obligated to publish results that encourage future funding for my research—that is, my research is not agenda-driven. I’m a retiree, a pensioner, with a background in fluid dynamics. The only funding I receive is from book sales and donations at my blog. Also, I’m independent inasmuch as I’m not tied to consensus opinions so that my findings will pass through the gauntlet of peer-review gatekeepers. Truth be told, it’s unlikely the results of my research would pass through that gauntlet because the satellite-era sea surface temperature data contradicts the tenets of the consensus.